Born in Alton, Kansas, Bruce Alonzo Goff was a child prodigy who apprenticed at the age of twelve at the architectural firm of Rush, Endacott & Rush in Tulsa, Oklahoma. In 1929, at the age of 25, Goff became a partner with the firm. 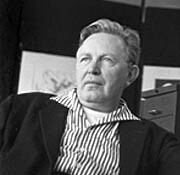 After stints in Chicago and Berkeley, Goff accepted a teaching position with the School of Architecture at the University of Oklahoma in 1942. By 1943, despite a lack of credentials, he became chairman of the school. This was his most productive period. In his private practice, Goff designed an impressive number of residences in the American Midwest, developing his singular style of organic architecture that was client-and site-specific. Goff's design portfolio includes about 500 projects (about one quarter of them built). Noted project by him include the Bavinger House and the Price House in Oklahoma, the Colmorgan House in Glenview, Illinois, and the Japanese Art wing at the Los Angeles County Museum of Art. In 1975, Goff was hired to rework a 1920’s era American Foursquare home on south Queen Anne in Seattle. Completed in 1976, the Gene & Betty Taylor House at 173 Ward Street, is Goff’s only known design in Washington State. One of Goff's draftsman, Clifford Dobson, moved to Washington in 1954 and brought many of Goff's avante guard ideas with him.